WASHINGTON — Last week, three immigrant parents who had been separated from their children at the U.S.-Mexico border wrote to a federal judge pleading for more information about their children, including where they were, who was watching them and when they'll be able to see them again. On Wednesday, that judge gave the federal government a week to provide answers — and to let those parents speak to their children more regularly. The parents, all Central American asylum seekers detained in Texas, sued the federal government last week for separating them from their children, who range in age from 2 to 13. They had been split up due to President Donald Trump's "zero tolerance" policy, which calls for the criminal prosecution of anyone who crosses the border illegally. Since kids can't go to federal jail, more than 2,000 of them were separated from their parents because of the policy. The Trump administration has since ended the practice of family separation, but many families remain split. 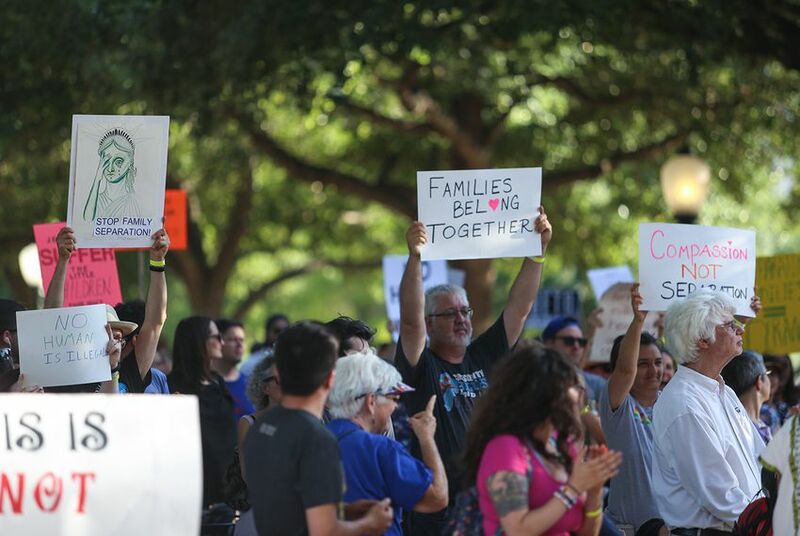 Texas RioGrande Legal Aid attorney Jerome Wesevich, who is representing the plaintiffs, sought a temporary restraining order requiring federal officials to provide daily information to each of the three parents. On Wednesday, D.C-based District Judge Paul Friedman stopped short of granting that order but called on the government to provide more information about the kids — including an estimated date when they will be reunited with their parents — and more frequent communication between the parents and their children. All three of the parents in the suit are seeking asylum, and one — a Guatemalan mother with three children — entered the country legally by requesting asylum at a port of entry. Nonetheless, federal authorities detained the mother in Texas, forcibly separated her from her children and sent the children to New York, according to the lawsuit filings. She has been able to speak with her children twice a week, but "these communications are costly and unreliable," the filings state. Another Guatemalan woman in the suit, who entered the country near Presidio with her 9-year-old son in May, does not know her son’s location and has been permitted only brief and sporadic calls with him. The third parent in the suit — a Honduran man who crossed the Texas-Mexico border in early June with his 12-year-old daughter —had not heard anything about the location of his daughter until an hour before Wednesday’s hearing, according to Wesevich. At that time, his lawyers learned she is being detained about 40 miles away from her father in Texas. At a hearing Wednesday in Washington, D.C., Department of Justice lawyer Sarah Fabian said the parents were given the names and contact information of case managers responsible for their children. The government also agreed to let the parents speak to their children at least twice a week and to provide information about the locations of the facilities housing them. But Fabian declined to specify dates for reunification, since she said case managers do not yet have that information. Individual case managers have discretion over when to recommend that the Department of Health and Human Services’ Office of Refugee Resettlement reunite a child with his or her parents, Fabian said. But without a reunification date, Wesevich said, the parents have no assurance they will see their kids again at all. “What the date of reunification is, is hope for the parents,” he said at the hearing. Wednesday’s hearing came on the heels of a California federal judge’s preliminary injunction Tuesday that compels the government to reunite all children with their parents within 30 days and children under 5 with their parents within 14 days. That injunction also mandates that officials allow parents to speak to their kids over the phone in the next 10 days.